This lesson contains some specific information about exporting lessons to Google Sites. 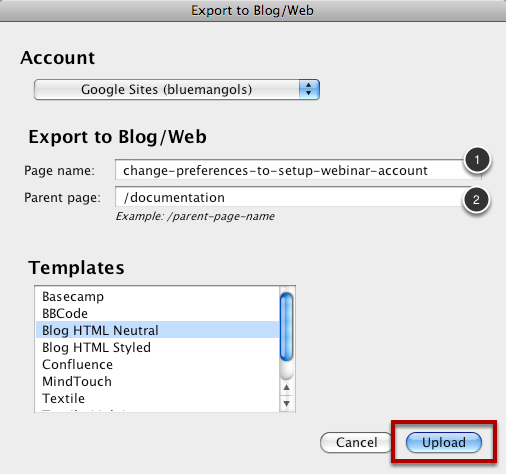 For general instructions on exporting a lesson to Blog/Web see this lesson. When you export a lesson to Google Sites there are two things that you can configure: the page name and the parent page. 1) Page name: The page name is the name that will be used to access the page in your web browser. This name can't have any special characters such as spaces, slashes or periods. In most cases you can leave the default value as it is. 2) Parent page: If you want to make the lesson you are uploading a subpage of an existing page on your site then you can enter the path to the parent page here. You don't need to enter the full url however. Just enter /documentation. ScreenSteps will remember the parent page you entered the last time you uploaded a lesson so that you can quickly add multiple lessons to the same parent page. When you are done configuring everything click Upload to upload the lesson and create a new page. It seems you only get to choose the page name, and parent page only once. It remembers it from then on for that lesson. What happens if you want to rearrange the site? @Dave: Just rearrange the pages using Google Sites. I have to agree with Trevor here.. I've been using ScreenSteps Pro to create a online operations manual and have found it easier to just upload to my Google Site with-out a parent page and just move it where I need it after it has successfully uploaded. I agree with dave, the most awesome part of screensteps is simplicity. I like "Set it and forget it." Especially if I have to do many updates. to do it manually adds MANY more steps, as the pages would have to be deleted, Then uploaded, and finally moved. Right now, I duplicate the lesson and delete the original. That lets me set the parent page again. But it really needs to be changeable. @Scott - we released 2.9.2 today which now uses the existing parent page on the site when updating a lesson. This means that you can move a page around on the site all you want and still update the lesson from within ScreenSteps. No need to delete or duplicate.